AQUIS specializes in the comprehensive refurbishment of aging mechanical air handling units. With our innovative composite coating systems, we extend the life of mechanical air handling units without the disruption and high cost associated with equipment replacement. AQUIS provides a custom-engineered solution to address the specific concerns of your air handlers. With hundreds of customers nationwide in healthcare, higher education, manufacturing, commercial real estate and government. The AQUIS System is a patented composite technology that provides the only available solution which meets all regulatory requirements, including NFPA 90A, ASHRAE 62.1, Joint Commission and others. AQUIS extends the life of your air handlers while maintaining safety and compliance within your facility. 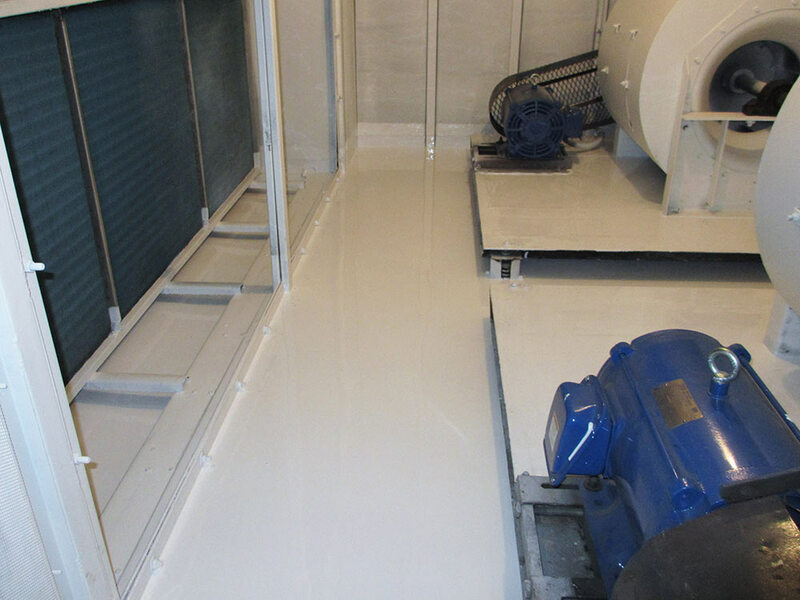 The AQUIS solution achieves maximum durability through a multi-layer composite coating system (illustrated below) which seals and re-pitches condensate pans, chamber floors and other surfaces, thereby eliminating damaging water leaks and halting corrosion within the air handler. By eliminating standing water and providing a smooth, hygienic and antimicrobial surface, AQUIS abates the growth of pathogenic biological agents such as Legionella, Stachybotrys (black mold), and Staphylococcus (Staph). To ensure maximum durability, AQUIS incorporates an advanced nanotechnology which provides superior adhesion to steel and concrete surfaces.